I'm suuuper excited about this fun new series called This For That. As I said the other day, I'm trying my bestest to be vegan these days. So I reached out to the author of one of my favorite food related blogs, Rikki Cupcake of Seitanic Vegan Heathen. 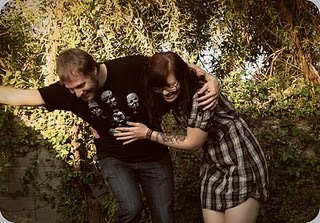 (How cute is this pic?? )This girl is chock full of foodie knowledge and has been so helpful to me in my trek. Here she'll be doing a series on vegan replacements. If you've been toying with the idea of becoming a vegetarian or vegan, you've gotta hear from this girl. Rikki and I were talking the other day about how the typical conversation goes when a person finds out you are vegetarian or vegan. It kind of becomes this scripted interaction where you're sure to run into all the usual questions and comments- "Where do you get your protien?" "I could never give up ___!" and on and on. A lot of folks think you've got to give up so much but the truth is, these days it can be super easy to eat a compassionate diet. Through this series This For That, Rikki's gonna teach us all about the myriad of vegan substitues are out there so all of us can put the smack down on our animal derrived vices (if you so choose, of course : ). I spoke a little bit about it a while back about my reasons for eating veg. I'd really like to discuss a little more depth my reasoning but I don't wanna bog you down in too much info (especially when y'all could be reading Rikki's amazing content. But no fear- I'm working on a big, fun, informative post that will be coming soon. So without further adieu- Meet Rikki! So, you are thinking about going Vegan, you have your mind made up, you are determined to save the planet, hug some baby cows and become a vegan superhero, you are ready and then you decide to pour yourself a bowl of fruity-os and then you become completely baffled as what to drown them in. Might as well go back to bed and start over, right? Wrong! Milk replacement is one of the easiest things in the vegan diet, there are handfuls of dairy milk replacements, so much in fact you may feel jipped having had only two options (cow's milk and goat's milk). Now you can jump for joy as you have so many more options then before. There is soy, one of the most popular choices out there, and has reportedly been used by the Chinese before the 12th century. 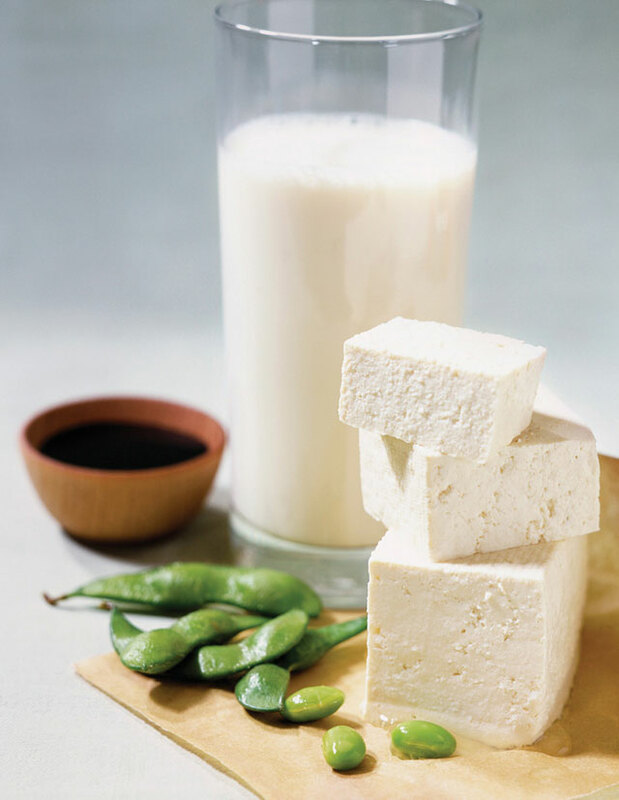 Soy milk is quite thick, very similar to full fat cow's milk, and has nearly the same amount of protein. The taste can seem a bit "off" the first time you try it, the key is to properly refrigerate your soy milk ahead of time and shake the bejeezus out of it before pouring it on your tasty breakfast cereal. Once a box of soy milk is open it has a lifespan of seven to ten days, after that drink at your own risk. Soy milk is great for making ice creams, puddings and yummy alfredo sauce for pasta. You can even get vanilla flavored or chocolate flavored soy if the plain is, well a little too plain. Another great and incredibly tasty milk is almond milk. Almond tends to be a little lower in fat than the soy, is a great alternative to those with soy allergies, and is okay to drink during Lent. Almond milk is great for baking, it adds a great flavor profile and because of its thickness it hold up just as well as cow's milk. Almond milk ice cream, smoothies and coffee creamers all have a velvety smooth texture and a simple and sweet taste. 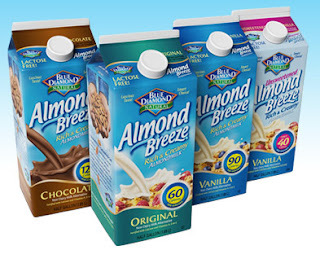 These to come in vanilla and chocolate, and the company Almond Breeze makes 40 calorie Almond milk, perfect for those on a diet. Another nut milk on the market is hazelnut milk, it tends to be a bit more pricey but is very high in vitamin E. Hazelnut milk can be a bit more difficult to find and is worth the try if you can get your hands on it. Oat milk is the same way, higher in cost, more difficult to locate. It also has a lower protein count but can often times be fortified with calcium and protein. Oat milk is great in cereals and since it doesn't have an overly strong flavor it can be used for sauces in Indian or Italian dishes. Rice milk (a grain milk just like oat) is very easy to find and has a thinner consistency than most plant milks, it is the equivalent of fat free or 1% milk. 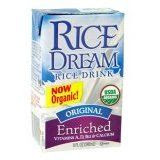 Rice milk has a slightly sweet taste and is perfect for adding to just about everything. It makes for light and fluffy desserts, is wonderful in coffee and the best part, is it is great for those with severe allergies. Since rice milk is made from brown rice it doesn't contain many vitamins or nutrients so it is important to purchase a rice milk that has been fortified with vitamins to make sure you are getting your daily intake of calcium, protein and B-12. Then there is coconut milk, and not the kind in the can either. There is a wonderful company called So Delicious that makes coconut milk that doesn't taste the least bit like coconut, so much so that I used it in my creamy mashed potatoes last Thanksgiving and no one was the wiser. 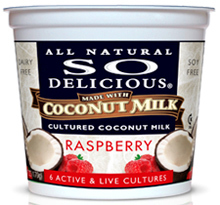 Coconut milk yogurt is the best yogurt on the market, it tastes so much like the real thing it is incredible! The last milk is hemp milk, drink enough of this stuff and you will be wasted! Ha ha, not really. To me personally, hemp milk tastes like old socks, but it is so high in Omega 6 and Omega 9 it seems like one should drink more of it. Here is my compromise, make ice cream with it, once you and a cup of sugar or agave to it the sock flavor disappears. Hemp is really good for your body and the harvesting of it is pretty good for the environment too. Remember when it comes to soy milk, buy organic, and that is not just the hippie in me saying this. Most soybeans in the United States are GMO (genetically modified organisms), which means you are putting potentially harmful stuff into your body. The good news, Starbucks uses organic soy, so next time you order a soy latte know you are helping a small farmer somewhere in the US keep his or her dignity and their farm. Now for fun, a recipe! For this recipe you can replace the soy milk with almond, hemp or coconut and get the same results, the creamer can also be replaced with a coconut milk creamer...yum! In a small bowl combine 1/4 cup soy milk with arrowroot powder and set aside. Mix soy creamer, remaining 3/4 cup soy milk and sugar in a saucepan and cook over low heat. Once mixture begins to boil, remove from heat and immediately add arrowroot mixture, it should thicken slightly, then add vanilla extract. Refrigerate for 2-3 hours and then freeze according to your ice cream maker. If you don't have an ice cream maker, what is wrong with you? Just kidding, head over to the store and pick up some Coconut Bliss or Tempt hemp milk ice cream. Both are AMAZING!!! (I can attest- the Coconut Bliss ice cream is insanely good! I've yet to try the Tempt Hemp milk ice cream but it's on my grocery list). Yay! How rad was that?! 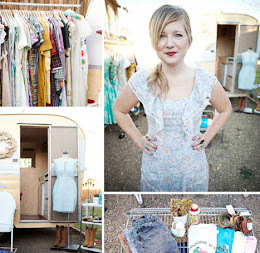 How rad is Rikki? The coolest part about vegan milk replacements is that grocery stores are gettin hip with it and often times offer many different options. That means you don't have to make a special trip to a natural foods store if it's out of your way. Stay tuned for more helpful veg goodness to come. Wow! So many delicious resources in this post. 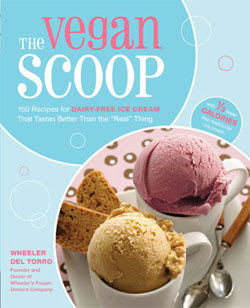 Vegan Scoop is such a great book, and I've made lots of delicious ice cream with the recipes in it. And So Delicious coconut milk yogurt is soooo good! I just heard they're coming out with a coconut milk Greek yogurt, too! Can't wait! yay! 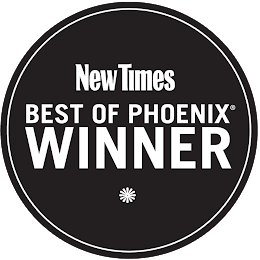 thank you so much for the kind words, up next...cheese substitutes!